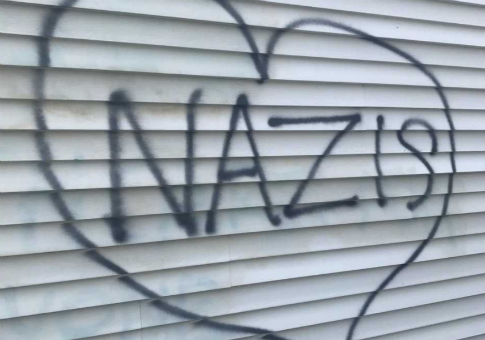 Vandals on Wednesday night spray painted the word "Nazis" in the shape of a heart on the side of the New Hampshire Republican Party headquarters. "I think it's safe to say that the staff was concerned. Obviously, it's an unpleasant thing for anybody to experience," Hynes said. He noted there are security cameras in the front of the building but not the back, something he said will change going forward. The state's Democratic Party chairman, Ray Buckley, issued a statement condemning the act. "Vandalism is unacceptable, it's inexcusable and it's wrong," Buckley said. "The New Hampshire Democratic Party wholly condemns this criminal action and hopes the perpetrator is held accountable. There is no place for that in our politics." Gov. Chris Sununu (R.), in a statement to WMUR, said, "It is certainly disturbing and very sad to see vandalism with such hateful rhetoric. There is no place for that in our politics or society." New Hampshire's senators, both Democrats, denounced the vandalism on Twitter. "Vandalism at @NHGOP office is disgusting & has no place in our society. Perpetrator must be held accountable," Sen. Maggie Hassan said. "Vandalism at @NHGOP is shameful & doesn't belong in our political rhetoric. We all need to stand together in the face of hate & bigotry," Sen. Jeanne Shaheen said. Vandalism at @NHGOP is shameful & doesn't belong in our political rhetoric. We all need to stand together in the face of hate & bigotry. The vandalism occurred as President Donald Trump continues to face criticism for his comments on the violence in Charlottesville, Va. last weekend, when white supremacist protesters clashed with counter-demonstrators. Critics said that Trump did not condemn white supremacists and neo-Nazis in a strong enough manner. This entry was posted in Politics and tagged Jeanne Shaheen, Maggie Hassan, New Hampshire, Republican Party. Bookmark the permalink.